Do they help? Several dietary supplement ingredients may help reduce joint pain (particularly of the knee or hands, but not the back or hip) due to osteoarthritis (worn joints), although the evidence is not overwhelming (see What It Does). As noted below, ConsumerLab.com tested the quality of products containing one or more of these ingredients. Which products are best? Several products failed to provide the amounts of ingredients listed on their labels (see What CL Found). Products that passed tests for quality are noted as "Approved" in the Results Table below. Approved products that also provided high-quality ingredients at lowest cost — indicating superior value, were selected as CL's Top Picks). Glucosamine and chondroitin: These may be used separately, but most studies have looked at these in combination. Modest pain relief may take several months. Look for products providing a total daily dose of 1,200 mg of glucosamine (sulfate or HCl) with or without 800 mg to 1,500 mg of chondroitin sulfate. See What it Does — Glucosamine and Chondroitin and ConsumerTips: Glucosamine and Chondroitin. MSM: Although in many products, the evidence is very limited for MSM. In animals, it is used to treat muscle soreness. An optimal dose has not been established, but dosage typically ranges from 500 mg to 3,000 mg. See What It Does — MSM and ConsumerTips: MSM. Boswellia: The resin of this plant contains an anti-inflammatory compound, AKBA, so its effects should be felt within a few days or weeks. Note that if only Boswellia resin is listed, it is likely less potent than Boswellia extract (i.e., an extract from the resin), as only about 1% of the resin is AKBA, while 6% to 40% of the extract is AKBA. A typical daily dose of Boswellia extract is 100 mg to 250 mg. Taking Boswellia extract along with fatty foods may enhance absorption. See What It Does — Boswellia and ConsumerTips: Boswellia. Combinations: Although combinations are convenient, their formulas (other than glucosamine and chondroitin) typically have not been clinically tested. Before trying a combination, try products with specific, single ingredients and see which, if any, help. This approach can also be less expensive, as combinations are sometimes more expensive than buying each of the ingredients separately. Cautions: Most of these ingredients can cause some gastrointestinal upset (such as nausea) and, although generally safe, some can interact with drugs (such as those for blood thinning), trigger allergies, or cause other side-effects. See Concerns and Cautions. For other types of supplements that may be helpful in treating joint pain, see ConsumerLab.com's reviews of Turmeric (an anti-inflammatory), SAMe, Ashwagandha, Cinnamon and Ginger, its article about White Willow Bark Extract (an analgesic), and information about UC-II and Vital 3 (which contain undenatured type II collagen). Glucosamine and chondroitin sulfate, and MSM (methylsulfonylmethane) occur naturally in the body. The glucosamine used in supplements is typically derived from the shells of shrimp or crabs although a corn source is also available (look for products identifying as non-shellfish). Glucosamine is available in a variety of chemical forms, such as glucosamine hydrochloride and glucosamine sulfate. These vary in terms of the amount of actual glucosamine available for use in the body from an equal weight of each form (See ConsumerTips: Glucosamine and Chondroitin for more information). Chondroitin sulfate is generally derived from pig or cow cartilage, but even shark and chicken cartilage has been used. Chondroitin-like mucopolysaccharides from algae are also available. MSM (methylsulfonylmethane) occurs naturally in the body but MSM in supplements is produced synthetically. The gum resin of the Indian frankincense tree (Boswellia serrata) contains compounds (boswellic acids) thought to have anti-inflammatory properties. Most supplements contain an extract of this resin, often standardized to contain specific amounts of one or more of these boswellic acids, such as AKBA and KBA. Glucosamine and chondroitin sulfate supplements are used in hopes of slowing the progression of osteoarthritis (the deterioration of cartilage between joint bones) and reducing the associated pain. Glucosamine is thought to promote the formation and repair of cartilage. Chondroitin is believed to promote water retention and elasticity in cartilage and inhibit enzymes that break down cartilage. 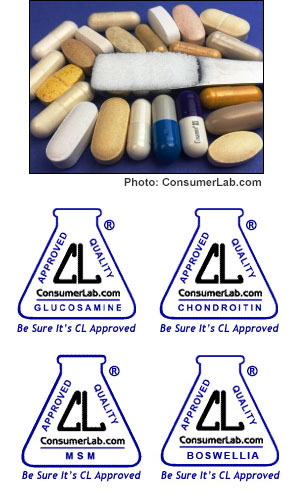 Many studies have been conducted with glucosamine and chondroitin (some are described below) and the results have been mixed. In short, they may modestly reduce knee pain if you have moderate to severe knee pain, although benefits may not occur for several months. In addition, if you have mild to moderate osteoarthritis, particularly of the knee, these agents may, over a period of years, slightly reduce the extent of further loss of cartilage volume. These agents generally do not appear to improve functioning of the knee, nor do they help with back pain or hip pain caused by osteoarthritis. However, chondroitin sulfate has shown some benefit over a 6-month period in people with hand osteoarthritis. Two major studies of the combination of glucosamine and chondroitin for knee osteoarthritis have been conducted, with somewhat different results -- although this may be due to differences in the form of glucosamine used and in the study populations. A study sponsored by the National Institutes of Health (NIH), called the Glucosamine/Chondroitin Arthritis Intervention Trial (or GAIT study), showed that the combination of glucosamine hydrochloride (1,500 mg per day) and chondroitin sulfate (1,200 mg per day) did not reduce narrowing of the joint space of the knee and only reduced knee pain among people starting with moderate to severe knee pain, not those with mild pain. A later study in Australia (the Long-term Evaluation of Glucosamine Sulfate or LEGS study) used glucosamine sulfate (1,500 mg per day) instead of glucosamine hydrochloride, as well as chondroitin sulfate (800 mg per day). That study focused primarily on people with early disease and mild pain. Although all patient groups receiving glucosamine and/or chondroitin reported a reduction in pain, the reduction was not significantly greater than among those receiving placebo. However, the amount of joint space narrowing which occurred during the study (an indicator of disease progression) among those taking the combination of glucosamine and chondroitin was only half the amount of narrowing which occurred among those who received placebo, and taking either glucosamine or chondroitin alone had no significant effect on narrowing. It would seem that the combination of these two ingredients may be important, and glucosamine sulfate may be more useful than glucosamine hydrochloride in slowing the progression of knee osteoarthritis. A 6-month study in Europe found that 800 mg of pharmaceutical-grade chondroitin sulfate (95% pure, Chondrosulf, IBSA, Switzerland — sold as a medicine in Europe but not yet sold in the U.S.) was similar to 200 mg of celecoxib (Celebrex) in reducing pain and improving function relative to placebo in people with mild to moderate knee osteoarthritis. It should be noted, though, that improvement took longer with chondroitin (6 months vs. 3 months for celecoxib), and the improvement for both treatments was only somewhat greater than with placebo, i.e., on a pain scale of 0-100, pain fell by 42.6 points with chondroitin, 39.6 points with celecoxib, and 33.3 points with placebo. All treatments (taken with a glass of water every evening) demonstrated excellent safety profiles. Due to the potential for side-effects with celecoxib (a non-steroidal anti-inflammatory), the researchers suggested that chondroitin sulfate should be considered as a first-line treatment for knee osteoarthritis (Reginster, BMJ Ann Rheum Dis 2017). A 6-year study among people who reported using glucosamine and chondroitin (no specific product) and had knee osteoarthritis without total loss of cartilage found no effect on pain reduction but a slight (1%) reduction in cartilage volume loss, particularly in the lateral compartment of the knee (Raynauld, Arthritis Care Res, 2016). A short-term (6-month) study in Spain of 164 patients with moderate to severe pain from knee osteoarthritis, taking 1,500 mg of glucosamine sulfate with 1,200 mg of chondroitin sulfate daily failed to demonstrate superiority over placebo in reducing pain and improving joint function limitation (Herrero-Beaumont, Osteoarth Cartlg 2016 OARSI abstract). A 6-month study of glucosamine hydrochloride (1,500 mg daily from Regenasure as a beverage) in patients with mild to moderate knee pain found that it did not decrease pain, reduce worsening of cartilage damage, or improve bone marrow lesions in the knee (thought to be a source of pain in those with osteoarthritis) compared to placebo (Kwoh, Arth & Rheum 2014). Glucosamine also did not decrease urinary levels of peptides considered predictors of cartilage destruction. The report notes that some longer-term studies using glucosamine sulfate, rather than glucosamine hydrochloride, have shown benefit in knee osteoarthritis. A well-controlled study of glucosamine sulfate (1,500 mg per day) versus placebo for lower back pain caused by osteoarthritis showed that both glucosamine and placebo improved symptoms reported by patients. However, there was no significant difference in the level of improvement between the groups, suggesting that glucosamine is not truly effective for lower back pain (Wilkens, JAMA 2010). A 2007 review of several past, large-scale studies of chondroitin alone concluded that it did not provide a benefit in osteoarthritis of the knee or hip (Reichenbach, Ann Intern Med 2007). However, a 2015 review of past studies concluded that chondroitin "may improve pain slightly in the short-term (less than 6 months)" and in 6 out of 100 people it may improve pain by 20%. In addition, chondroitin "slightly slows down narrowing of the joint space" and people taking it actually reported fewer adverse effects than those taking placebo (Singh, Cochrane Library 2015). A six-month study of chondroitin sulfate (800 mg once daily) versus placebo in patients with hand osteoarthritis showed a significantly greater decrease in hand pain and improvement in hand function among those taking chondroitin sulfate (Gabay, Arth & Rheum 2011). The duration of morning stiffness was also slightly reduced. These benefits were not noticeable until after 3 months of treatment. There was no significant difference in grip strength or the amount of analgesic used by patients. The chondroitin tested in the study was a tablet containing highly purified (95% pure) chondroitin of fish origin and is marketed as Chondrosulf (IBSA, Switzerland) in Europe where it is approved as a "Symptomatic Slow Acting Drug for Osteoarthritis" (IBSA website — accessed 9/21/2011). Interestingly, a study of Washington state residents aged 50 to 76 years found that use of glucosamine and use of chondroitin were each associated with a statistically significant decrease in mortality (a 17% lower risk of death during a 5-year study period), while there was no such association for 13 different vitamins and minerals, fish oil, fiber, or several herbal supplements. The authors proposed that the apparent benefit with glucosamine and chondroitin may relate to their anti-inflammatory properties (Pocobelli, Am J Clin Nutr 2010). Further analysis of the data revealed that the benefit may primarily rest with glucosamine (which is in most chondroitin supplements), as there was an even greater reduction (22%) in risk of death associated with glucosamine without chondroitin. Glucosamine was also associated with a particularly large (41%) reduction in risk of death from respiratory diseases such as lung cancer (Bell, Eur J Epidemiol 2012). In veterinary medicine, glucosamine and chondroitin, often in combination, are commonly used in the treatment of degenerative joint disease typically in older dogs and cats as well as in horses. (See separate review of Joint Health Supplements for Pets). A form of glucosamine called N-acetyl-glucosamine, or NAG, may be beneficial for inflammatory bowel diseases (IBD) such as Crohn's disease and ulcerative colitis — although the supporting evidence is far from conclusive and based on studies that lacked placebo controls. NAG is naturally produced in the body and helps to maintain and repair the mucus lining of the gastrointestinal tract. In Crohn's disease and ulcerative colitis, the body's ability to produce NAG may be reduced (Goodman, Gut 1997). A study in children with severe treatment-resistant Crohn's disease or ulcerative colitis found 8 of 12 children who received NAG powder (3 -6 grams taken with water in three divided doses daily) had clinical improvement; 4 had no improvement and required surgery (Salvatore, Aliment Pharmacol Ther 2000). In another small study, adults with IBD who were given 6 grams of NAG powder (Villicote, Wellesley Therapeutics Inc.) daily -- as three divided doses of 2 grams each, added to water — experienced improvements in symptoms: 58.8% reported improvement in abdominal pain (average symptom score decreased by 49%), 64.7% reported improvement in diarrhea symptoms (average symptom score decreased by 47%) and 41.2% reported improvement in nausea symptoms (average symptom score decreased 55%) (Zhu, Natr Med J 2015). Health Canada allows the claim,"Helps promote a healthy intestinal lining in people with symptoms associated with inflammatory bowel disease," for a product providing a daily dose of 3,000 mg of N-acetyl-glucosamine and 600 mg vitamin C (C-NAG, Vitex). There are no published clinical studies of the effects of NAG on irritable bowel syndrome (IBS), but one is underway (NCT02504060). NAG may also be beneficial for joints, according to a placebo-controlled study which found that a daily dose of 500 mg N-acetyl-glucosamine slowed the breakdown and increased the production of type II collagen in healthy adults (average age 48) without arthritis (Tomonaga, Exp Ther Med 2016). In older adults in Japan with knee pain and stiffness, a combination N-acetyl glucosamine (100 mg) and chondroitin sulfate (180 mg) taken daily for five months modestly improved function during household activities, but did not improve leisure time physical activity or reduce pain, compared to placebo (Tsuji, Aging Clin Exp Res 2016). Joint Health Supplements Review (Glucosamine, Chondroitin, MSM and Boswellia)!